We’d love your help. Let us know what’s wrong with this preview of Murder in a Wish-Book House by Wayne Zurl. 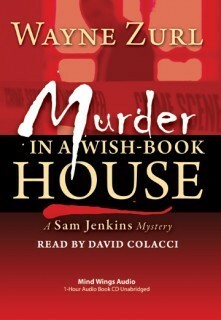 To ask other readers questions about Murder in a Wish-Book House, please sign up. Murder in a Wish-Book House is a novella that’s heavy on plot, light on character, but is definitely enjoyable and a good little mystery. Sam Jenkins is a police chief in small town Tennessee, but he used to be a New York detective so he’s got plenty of experience, friends on call and a bit of an attitude – all of which help him out here. At first the mystery seems simple enough, but there’s a bit of a twist that worked well. 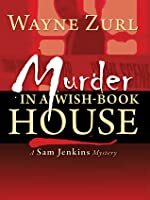 Sam is used to knowing what’s going on, he’s good at reading people an Murder in a Wish-Book House is a novella that’s heavy on plot, light on character, but is definitely enjoyable and a good little mystery. Sam Jenkins is a police chief in small town Tennessee, but he used to be a New York detective so he’s got plenty of experience, friends on call and a bit of an attitude – all of which help him out here. At first the mystery seems simple enough, but there’s a bit of a twist that worked well. Sam is used to knowing what’s going on, he’s good at reading people and tough to fool, but this time around someone gets the better of him. "Oh, This is a Bloody Good Story"
I just can't get enough of the Sam Jenkins detective mysteries. They are so consistently great, filled with good detective work, humor, and women who think they can sway the good Chief of Police. Now, a vicious murder has taken place in an ordinary, country farm house. It was a slash-and-stab psycho-like killing. The victim is Richard McBath, a beloved and respected teacher at the local school. His young daughter had spent the night at a friend's home and when th "Oh, This is a Bloody Good Story"
I just can't get enough of the Sam Jenkins detective mysteries. They are so consistently great, filled with good detective work, humor, and women who think they can sway the good Chief of Police. Now, a vicious murder has taken place in an ordinary, country farm house. It was a slash-and-stab psycho-like killing. The victim is Richard McBath, a beloved and respected teacher at the local school. His young daughter had spent the night at a friend's home and when the friend's mother drove young Nellie home, Richard's body was discovered. It was a horrible bloody scene, the house even smelled of death. Richard had been stabbed with a butcher knife 30 to 40 times, obviously by someone in a maniacal frenzy. The killer, however, took their time after the killing to shower and change into clothes from a closet before leaving the crime scene. Is there a wife, ex-wife, girlfriend? Sounds like Sam can solve this one easily, but ... there's more to tell. Yes! There is another murder. Read this awesome story where someone pulls the wool over the eyes of Sam Jenkins ... which seldom happens. That sometimes happens when one gets very arrogant such Sam does at times! Great story.